Dear Friend,We had a good crowd for worship on Wednesday for our fourth service! You can hear this week’s bible readings and sermon on the Audi0-visual page. On 3rd August, the Chase family arrive in Chiang Mai, and on Wednesday 7th August we will have our next service in their new home. (Email for directions! )This will be a great chance to get to know new people and we will again join for a meal following our time of worship. Please note: Next week we will take a break, so there will be no service on Wednesday 31st July! As usual, let me emphasise that our worship is open to all. Most people will probably find us by word of mouth, so please pass on this information to anyone you think might be interested. This week sees our fourth service at All Saints, Chiang Mai! For the next two weeks, we will continue to meet at 6:00 p.m. on Wednesday evenings, at the home of Ivan Hall. (Email for exact directions!) We will again share a meal following the service. However, on 3rd August, the Chase family will arrive from Egypt, so from 7th August we will meet at their new home. More details later! Many thanks to Ivan for hosting us for the first month of our life together. Is Wednesday evening good for you or would you prefer Sunday or another day? Let me know, things are still flexible in these early days. Finally, let me again emphasise that our worship is open to all. Most people will probably find us by word of mouth, so please forward this email to anyone you think might be interested. This week we will have our third service! We will again share the Eucharist, or Lord’s Supper, together. I am conscious that we all come from different backgrounds and traditions, so some of the parts may be familiar and others seem strange. Whatever the case, you are very welcome. We will then have a meal at a nearby restaurant. Finally, let me again emphasise that our worship is open to all. Most people will probably find us by word of mouth, so please pass on this message to anyone you think might be interested. 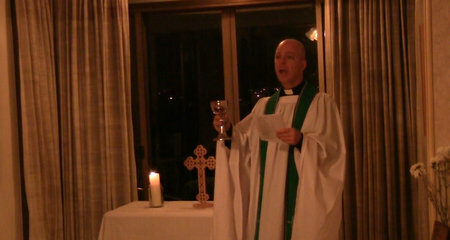 This week saw our first service of worship at All Saints, Chiang Mai. We were few in number – only two in fact! But it was a very good time of worship as we celebrated and received communion together. I know there were lots of people who would have liked to have been there, but were out of town on the night. You can see my first sermon at All Saints by clicking here. Ivan’s apartment is small, but we look out over the lights of Chiang Mai as we worship, so it doesn’t feel enclosed – quite the opposite. As I said in my sermon, we want to be a community that not only worships together, but also reaches out to the world with God’s love. All the candles and crosses, cassocks and surplices, mean nothing, if we are not truly worshipping God together and then going out to be the people of God – a people who love one another and share love in practical ways with others around us. We will continue to proclaim the gospel message that ALL are welcome in God’s kingdom! Next Wednesday, 10th July, we will again meet in the home of Ivan Hall, but this time at the EARLIER TIME of 6:00 p.m. This will make it easier for us to share a meal together following the service, which should last around an hour. This week we ate at West. Meanwhile, I would ask you to pray for my second country, Egypt. You will be aware of huge protests which led to the ousting of President Morsi. While I, and many people in Egypt, are hopeful about the situation, much prayer is needed for a peaceful and fair outcome. You can read more in this letter from a friend of mine, Ramez Attalah, the General Director of the Bible Society of Egypt. Finally, let me emphasise that our worship is open to all. Most people will probably find us by word of mouth, so please forward this email to anyone you think might be interested.